The 2N® StarGate is a solution for SMEs and LMEs that have a high amount of calls to mobile networks. It is a GSM/UMTS gateway able to significantly cut the cost of telephone calls. Its efficient, automated and cost-saving solution will find the cheapest route and always use the most suitable SIM card. 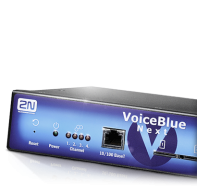 The 2N® StarGate can be connected to your current PBX system through the PRI ISDN or VoIP interface. Whether you are a large company, a call centre or an international business operation, the 2N® StarGate can definitely reduce your telecommunication expenses.